The question of how much lawn is too much could be debated for hours! Critics clamor that lawns are a monoculture (single species) which inherently support limited biodiversity. Being comprised of few species puts lawns at increased risk of pest and disease problems. Lawn maintenance often involves the use of copious amounts of time, water, pesticides, and synthetic fertilizers derived from fossil fuels. As a nation we are enamored with our lawns. One statistic states that the land area collectively occupied by lawns in the United States equals a land mass greater than the combined area of Delaware, Pennsylvania, and Rhode Island. Within a garden a lawn is a powerful presence. Open areas of green allow the eye to pause, giving the viewer an opportunity to rest and contemplate before moving onward. Lawns are social areas. 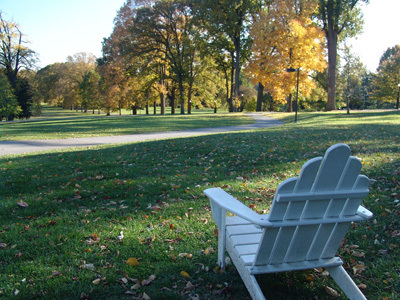 At the Scott Arboretum, students and visitors are often seen studying, playing, and conversing on the numerous grassy areas throughout the Swarthmore College campus. While lawns provide a key role in the design and feel of a garden, there are often areas where turf grass will not grow. 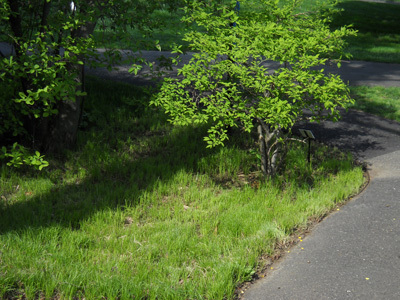 The area may be too shady, dry, wet, steep, or too restricted a space. What to do? Enter the sedges. William Cullina’s text, Native Ferns, Mosses and Grasses, provides an excellent introduction to the genus Carex, more commonly known as sedges. The book does not claim to be comprehensive, rather emphasizes several of the most ornamental sedges. Another great resource is The Color Encyclopedia of Ornamental Grasses by Rick Darke. 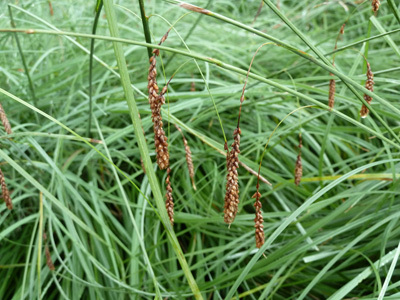 Dozens of sedges, both species and cultivars, are highlighted. Cullina notes that sedges comprise one of the largest genera in North America. It is thought that there are perhaps 500 species, most of them commonly associated with wet, boggy areas. In southern areas of the country the generalization of sedges as swamp and marsh dwellers holds true. In the northern reaches, sedges outnumber grass species and inhabit dry mountain slopes, forested woodlands, and stream banks. I, like many people, learned the rhyme “sedges have edges, rushes are round, grasses are hollow and spread ‘round.” The phrase emphasizes the characteristic that sedges bear leaves with a v-shaped cross section. As with most plant characteristics, there are always several members that don’t follow this rule, but overall the v-shaped profile is a good identifier. 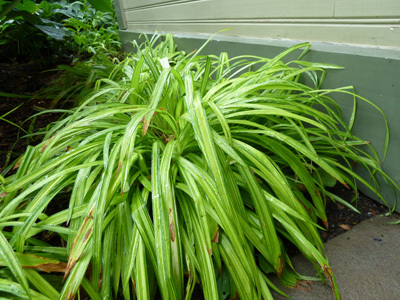 Culturally, sedges are easy to grow and maintain. 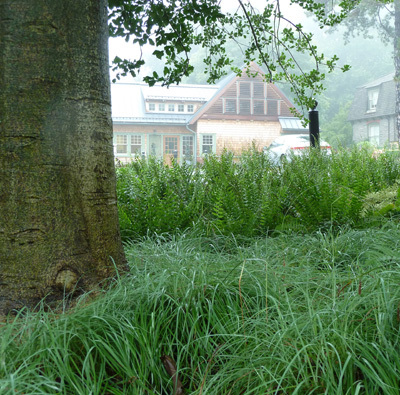 The most critical consideration is to choose the appropriate sedge for the site conditions. Sedges are used with increasing frequency at the Scott Arboretum. The genus Carex has proven itself to be diverse and reliably hardy. It’s ideal for areas where one wants a lawn-like feel but growing turf isn’t feasible. Sedges are used along steep sloping banks, garden areas that are perennially water-logged, and under young trees where mowers have a difficult time navigating and such machinery could cause damage. 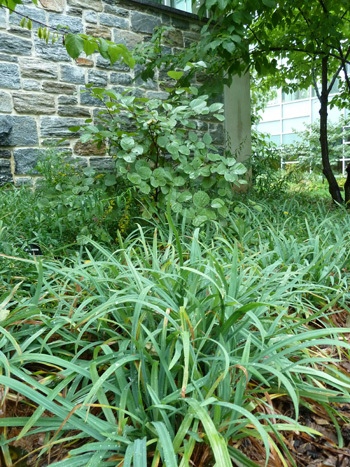 The Scott Arboretum is pleased to offer three garden-worthy sedges at the 2011 Scott Associates Plant Sale. Carex laxiculmis Bunny BlueTM is a compact clumper bearing silvery blue blades. 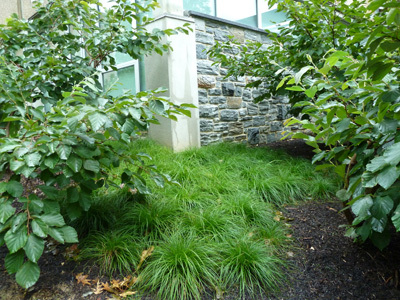 A native, this sedge was used extensively in a planting around the Cornell Science Library and in the Glade Garden. C. laxiculmis Bunny BlueTM with its unique coloration can be grown as a small garden accent, or planted in mass for a vivid visual vista. Site in full to partial shade in average to wet soils. Another blue-hued sedge to consider is Carex flacca ‘Blue Zinger’. This cultivar produces leaf blades that are narrower than C. laxiculmis Bunny BlueTM. C. flacca ‘Blue Zinger’ was used throughout a recent planting around the Cunningham House and Wister Center parking lot. It was an ideal choice because of its ability to thrive in a range of light and soil conditions. While the previous sedges are low growing, Carex muskingumensis ‘Oehme’ reaches 12-24” in height. Leaf blades emerge light green. A yellow margin develops as summer progresses. North Creek Nursery, a wholesale nursery in Landenberg, PA, suggests using this cultivar as a substitute for dwarf variegated bamboo. The Oehme variegated palm sedge appreciates moist sites that mimic the damp streams and meadows it is native to. Need more motivation to try sedges? Most, including the three offered for sale, are deer resistant. Once established they provide the visual presence of a lawn while using far fewer resources. Pests and diseases are few. Josh: excellent piece! You may know that Mt. Cuba is preparing to begin a trial of sedges. Carex really is a wonderfully diverse genus. Great to see the use of sedges at Scott Arboretum. Including many people in the decisions on what to plant was a super idea. Keep us posted on how these plants do over time and what maintenance your use (mow in spring?) if anything. Great article Josh! Very informative. I think I will have to use “vivid visual vista” in a conversation sometime soon. Well done! Carex have so much potential in the landscape. I have border in my woodland garden, a smart garden.